About a year ago, a friend of mine shared an experience that was thought-provoking, and this experience offered my friend potential healing and positive transformation. This experience was called a Medicine Reading with a seeress named Deborah Hanekamp. Deborah is also known as Mama Medicine. Intrigued, I reached out to Deborah to invite her to be on my podcast. I wanted to learn more about her and what she does, and I know that others would also enjoy listening to our conversation. She graciously accepted, and came to my apartment last February for our first meeting over a cup of tea. Throughout the conversation, you may notice standard NYC background noise, including sirens. In a Medicine Reading, you come in. We sit together. I read your aura, I tell you what I see coming up in your auric field in an in-depth way. You could have a specific intention, or something you're looking to call in, or clear out, that we could focus that around. Or, it could just be in general, I tell you what I see coming up. And then you lay down on a bed of crystals that emits infrared rays, and you do a specific breathing exercise. I send distance healing and chakra balancing your way, and also do a lot of sound healing through the [medicine songs that I learned in the Peruvian Amazon], and different instruments, and different crystals will be placed on your body. But, basically you incent. I mean there's a lot of different elements that are yours. Yeah, yeah. I mean some people come and they feel nothing, but usually it's a very out of body experience because I'm calling your sphere up out of your body, balancing everything out, and putting it back down. Deborah and I proceeded to talk about various topics: such as auras, which are enery fields that we generate and that can be seen as colors by some people, including Deborah. Deborah and I also talked about spirits; destiny, what we can learn from hardship, including diseases, and more. I hope you enjoy listening to this conversation. I know I will continue to revisit it. 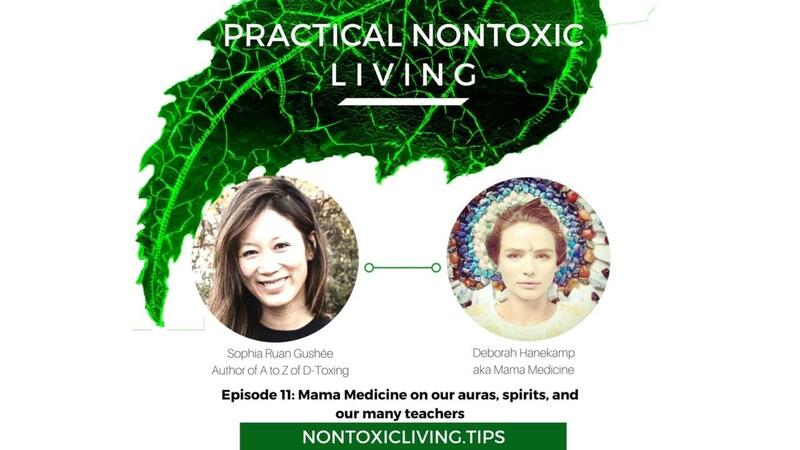 Click below to listen to my podcast with Mama Medicine (it's also available on major podcast platforms, like iTunes, Stitcher, and Overcast). Or, review the transcript below (it's been modified to be more reader-friendly). Sophia: I’ve been doing yoga for quite a while, so I’m already familiar with ancient traditions and different ancient tools for healing, self healing, and of self-discovery. But still I had to look up certain terms as I was reading about your background, like Reiki, which I've always heard about but didn't really understand. And what exactly is a Shalman. I figure I'm probably not the only one who would really love to hear more discussion on what you studied. I loved this video you had on your website, where you talk about studying yoga and Reiki, and being in the Amazon to study under a shaman, and then you just realized you're supposed to be just you. I would love to hear more about that. Deborah: Yeah. it was such a long journey back to myself… When I was 17, I had a series of three really strong tragedies that woke me up and kept me from being just like a regular teenager, to really taking my sensitivity very seriously, and having a deep calling towards this curiosity of the divine that I always had. Sophia: And you remember being curious about the divine from ever since you can remember? Sophia: Was your family spiritual? Deborah: Well, they had their own form of spirituality. They were actually in a cult-like religion. It would be called Baptist, but it was it was more than that. And I would say that institution is part of what added to a very tumultuous upbringing for me, but I always knew that wasn't the way. I had a really strong example of basically non-tolerance being not what spirituality is, and that spirituality is more for exploring open, and for really showing love for each other, and being kind to each other, and not necessarily, like, if you're not this one exact way then you're not able to be spiritual. I had already walked away from the religion when I was 12. From 12 to 17 were very hard, very rebellious years, living on my own at that age, because I was, like, this terrible I’m leaving it. And really stood strong against what I felt was very wrong. Then at 17, after these three strong tragedies, I decided not to be rebellious in a way that was self-destructive. Now, I'm going to take that rebellion and just let it be my strength and let it be for my light. And that's when I got really into first vegetarianism, and that was more of a spiritual decision for me just because I love animals, and then not eating meat led me to Zen meditation, and Zen meditation led me into yoga, and yoga just took my heart. I loved it so much, and then I took yoga teacher training, and I ended up teaching yoga, and then I ended up taking yoga teacher training, and I had my own yoga studio and healing center. And then I started traveling back and forth to Thailand. Over the course of five years I studied Reiki, which is a form of energy healing where you just channel light to a person. Sophia: Do you sense where there are imbalances in someone's body, and then that new channel light into the areas that we benefit? Deborah: Yes. Traditionally, in Reiki, there's like a set of hand positions that you use so that whole body gets light, and all the organs, and things like that. And then you kind of feel around for if there's any energy blocks anywhere, and then you clear them with light. It's a really beautiful very relaxing practice. And it's really nice how anyone can do it. I learned in Thailand. And also I learned how to do psychic surgery, where you like go in and you get like you get these different guides and guardians for specific tools to remove any kind of particular blocks. For example, someone could have what would look like a shackle on their ankle. And then one can get like specific tools to remove it. And sometimes I even get messages on exactly what that shackle means to that person. For example, you got a break more dad's rules or something like that. Deborah: Yeah. I would say there's different levels. Like, when I sit with you, I see just a lot of green and gold around you. So I see you're very compassionate. You're very protected. But I was to really sit with you, I would see what the different vibrations in your aura were saying. For example, if there's stuff coming up in a relationship, like if you felt like you weren't being seen in your relationship, I will tell you I see that, and that's part of the first part of the medicine reading, is just to look, and I tell you what the different little things coming up in your auric field are and explain them to you. Sophia: What contributes to one's aura field? Deborah: Well, it changes. It's not always the same. It's not always just like one solid color either. So I think what you're going through in life, that's what your aura will represent. But then there will be a color around people that is usually pretty consistent. For example, my husband, he pretty consistently has an opal aura. And if he's not feeling well, it might be a yellow ochre or something like that. But, pretty consistently, he has Opal around. But if you’re really super stressed out, if we're going to like a lot of material difficulty, the aura will just be small and red. If you're feeling really inspired and really expansive and happy, there will be a lot of orange and the aura will be very vast. Sophia: So, as a child you would see the aura, and it evolve, and that must be amazing as a child. Deborah: The thing is, nobody said, No, that’s just your imagination. Sophia: Did you tell anyone as a child? Deborah: No. I just thought everyone saw people that way. Then, around 11, I would start talking to my friends about different colors around them and they didn’t know what I was talking about. Sophia: So can you talk about what exactly is a Shaman? Deborah: It's an interesting word, Shaman. In Peru, they don't use the word. They call themselves curers or healers. And when you get an initiation into the form of Shamanism, you become a curer, not a shaman. But, Shaman, that word now is very wide spread. And I think it describes anyone who is using ancient techniques to access the spirit realm. But the word shaman originates from a tribe in Siberia who would have a very specific way of doing soul retrieval, where if someone has a fear, a part of their soul goes and hides, and then they go into the spirit world, find the soul, and then bring him back to the person. That technique comes up in several different forms of Shamanism around the world, but the original word shaman comes from that tribe in Siberia, and now it's just wide spread. The definition has changed. It's just widespread to anyone who is using these ancient techniques to access the spirit world. It originated with this tribe in Siberia, but cultures from around the world have developed their own tools and approaches to retrieve parts of the soul that can get lost in the spirit world for a variety of reasons. Sophia: So this just raises so many cool questions about spirituality, our purpose, the soul. From \the perspective of the Shaman, does a person have one soul? Deborah: Yes, but they can have parts. Ideally, it's all together, all cohesive. But if we experience trauma, it can become fragmented. And part of the soul can I can go into hiding. And even if it becomes fragmented, even some believe that there will be a dark being that is keeping that soul in that place, so the soul goes away to hide, and somebody gets captured and gets put into a spirit jail. Sophia: Is the intention of that spirit to protect? Deborah: No. It's interesting how sometimes when we are afraid, we try to find ways to protect ourselves but they're not always good for us. I’m not talking about both in the material world, and in the spiritual world. Like, if you're watching a scary movie, and you see people going exactly into a trap. Out of fear, they’re running frantically into the trap. But they shouldn't be going into it, and the whole time you're like, No no no don't go there. It's very similar in the spirit world. Because fear is basically the opposite of love. When we are existing and operating in a place of love then we are so protective, and are so safe. Sophia: Protected by these by spirits who are there to support? Deborah: Well, yes. But also by spirits who are there to support. But it is the love that is within us that attracts those spirits to support us. Sophia: So, we attract certain energies? Sophia: And are these spirits related to us somehow, either through ancestry or the feelings we choose to embody, or feel, or attitudes we choose to have? Or are there just general spirits? Can you shed light on this in the spirit world, and even on good and evil? Is it mostly good? Deborah: I have a very interesting view on good and evil. I think that there is definitely light and dark, but I think that if we if we avoid the dark places within ourselves, within our emotions, if we avoid that, then it just grows. But if we look at it, we really see it, we really sit with it, then we can gain wisdom from it. Obviously, we all want to exist and operate in the light. But the only way to do that is to acknowledge the dark. When we know the dark, we can know the light too. And we all have light and shadow within us, even if we are super philanthropic, compassionate, and joyous, we still have shadows. The shadow is there to teach us, so our spirits can grow, so we can become wiser. So with the spirit realm, we have a lot of light around us, if love is something we're cultivating in our life. If we're asking ourselves, as we look at our shadows, ask is there love for this too? If we're trying to grow compassion, and move away from conflict, or just become more unified within ourselves, then in the spirit realm, we're attracting more of our guardians. Ancestors are often around people. Ancestors can be there protecting. A lot of times they are around to protect. Or, the ancestor is there with a specific message. For example, I just saw a woman the other day whose mother was around her, and really trying to encourage her to move forward in a new relationship. Ancestors can also be around us because there's something within our lineage that we need to really look at, and this could be considered dark or shadow, that we really need to look at to no longer carry it with us. So, if it is common within the ancestry to, like, ignore their children or something like that, an ancestor will often say, Pay attention to them [children]. They [children] are everything, and guide the person towards breaking an old pattern. We also have plant and animal spirit guides, and guardians who will show up to us. Usually, if it's an animal, we feel just very called too, and that animal will be around us, and act as a guide, and act as a guardian. And the same with different plants. And then there's different beings too, who knows what dimension they’re from, who could be angelic beings and things like that. Then there's their spirits, there's people who pass away who don't know that they are dead, who are left behind. New York is filled with spirit. Sophia: So do you see them, or you just feel them? Deborah: Yeah, I see them often. Sophia: Do they look like a person? Or are they colors? Deborah: Sometimes it will look like you see someone’s shadow, but most of the time it's like a spot of light. Like a light being will be like a spot of ultraviolet light. And a more questionable energy would be like a gray, or even like a black kind of, spark that would come up. Sophia: Is it small, like the size of a person? Deborah: No, it's smaller. It's maybe like the size of a person's head. Sophia: And you see a lot of new work? Deborah: Oh yeah. Oh yeah. Deborah: Both. New York has a very special energy. New York has a very strong energy. Sophia: Why do you think there are so many in New York? Just because there's a high density of people? Deborah: Yeah. If all of these people here have spirits, then there's just so much spiritual history here. All these people have been attracted maybe to this on earth because it's like we're on a giant quartz crystal, which has a tendency to attract energy. Deborah: I think that quartz because of its clarity. But when you look into it, there's so much in there. If you pick up a clear quartz crystal, hold it up to the light and you look at it, there's like a whole universe in there. So I think it attracts the people who love mystery, and who are just like curious and adventurous, and this kind of thing. Quartz crystals in general attract that. But places around the world that are on quartz crystals will also attract that. New York, I mean, there's , so many people and there's so much history. A lot of people have a very hard time here. They have a very good time here. And that energetically just stays and creates the vibe of the city. So when I walk around New York there's like a lot of places I don't wanna go into at all. Deborah: Yeah. whatever the spiritual history of the building is, I feel, Oh yes, I go on there, no problem. Sophia: Do you have to see it, or you can feel it? Deborah: Yeah. buildings have a sort of aura around them too. Like, the Statue of Liberty has a bright yellow. Sophia: What about Ground Zero? Deborah: It's really rough there. It's really, really rough. I mean, I honestly try not to go there at all. It's just it's too intense. Deborah: It depends on the church. Most of the churches here in New York are OK. Yeah, there they're OK. They're fine. Some of the churches that I've been to in Peru, No, I would go in, and go right back out. And I think that has a lot to do with like the Spanish Inquisition, and the way the indigenous were treated there. But also like some of the churches in London, Amsterdam, I think, I don’t want to be in here. Sophia: So places with a lot of history can be difficult. So if you're looking for a new home, like a new apartment in a brand new building that was just newly constructed, will it have more clear energy because there is no history, even though the land has history? Deborah: It actually depends. It depends who was making, who owns, the building. If it's new, but it was put together by someone who has bad intentions, I wouldn't want to be in that place. Where we live now, my husband's really good friend owns the building and you can feel his energy, and the building is so nice. I just got a space in Soho for my work. It took months. My poor real estate agent. It took months to find a place because we would walk into a place and I would be like, No, the landlord has bad energy. No it’s haunted. And I could feel mold in a space, that substance has such a bad energy. Sophia: So how influential can the spirits be especially for someone like you who's so informed on how to protect yourself. Deborah: Influential in what way? Sophia: Well, for example, I would think that walking into a space in Soho that maybe makes sense for your work for a number of reasons like location, for you to be aware of the energy is huge. And then when you can keep the darkness or the shadows at bay, and manage the spirits. But, it seems like your reaction is that, I just rather not be here. Sophia: So they really can influence you. Cause I'm just wondering, as a regular person, we don't think about how our space and even how the people we surround ourselves with, can influence us. From what I'm hearing from you, it sounds very influential. Deborah: Absolutely. Even if someone is not spiritually sensitive at all, if they move into a haunted house, they get sick. They have a lot of discord in their relationships. They have like a hard time in the job. It's sort of like they're working with a very very difficult energy. I sort of think that for what we need to learn in life and experiences, they needed to be in that house for a specific reason to learn something or move through something. So that’s why I never really viewed it as bad, just a learning experience. And some of us need to learn harder lessons than others. I had to learn really hard lessons earlier on in life to decide really want to have like a blessed life. But I see people who are not spiritually sensitive at all. They'll say, Come check out our new house. And I’ll see that the house is totally haunted. But I don't like to say things to people because I don't want to tell that their brand new house, that they’re so excited about, is totally haunted. But, then, like, six months, after moving into it, something feels weird, or something like that, or they'll get sick, or I don't know. So it definitely influences people, whether you're sensitive or not. For me. I would really rather not have to constantly clearing a space and working against an energy. So the space that I chose is very spiritually quiet. There's just not a lot of energy in there at all. Even though it's on Spring Street, which is kind of a busy street. This space is just open and clear and the energy is very clean. Sophia: And that could change too, right? Sophia: Like, if depending on your neighbor, right? Deborah: Yeah. Depending on the neighbor or where. The people who embody a space can shift the energy in it. You were asking before about spirits being around people. Sometimes spirits that don't necessarily have good intention will find a person to use as a host, and they'll attach themselves to that person, and they will sort of follow them around, and the person will be drained. And this happens, like, often, actually. And then that person will go in that space, but they'll also be bringing the spirit with them into that space, and if that spirit isn’t cleared out then the space can have that energy that that spirit is bringing in. Even if you're not spiritually sensitive, sometimes different people around you, you feel you don't want to interact too much with that person, and I'm not sure what it is. I don't know what it is about this space but I just don't feel good in it. But, to me, that's very much something happening on a spiritual level. Sophia: So are these spirits souls? Are they different? Deborah: Sometimes. Yes and no. When we're saying somebody who was embodied, and then passed away, and so sometimes, but there's also just spiritual energy too. Sophia: So what do you think happens when you die? It sounds like the soul never dies? Deborah: Oh wow, that’s such an interesting question. I think I should start by saying, I don’t know. Sophia: You feel like you don’t know from these spirits? Deborah: I think birth and death are two of the great mysteries of life. But I can say that after death, a spirits can hang out. For example, if a matriarch passes away, she may hang out to check up on everybody, she'll see how everything is going, she’ll wait with the ones who are having a really hard time with her passing. When she feels like she has guided every one as much as she can, she’ll transition. After that transition, I can't say. I can't say. I don't know. I do really feel like with an ancestral bloodline, and also outside of it, souls had a tendency to come back. So a lot of times someone's child was their grandparent. But in between the place of losing one body, and after day the soul is done hanging out and checking up on everybody, in-between finding a new body, I'm not sure. I don't know. I don't know. I think that the souls who hang out, some souls, I guess you could say ghosts, they are very very old very very very old. But the consistent thing I see with them is that they don't know that they're dead. Yeah yeah. Sophia: So like so they operate among the living and don't feel different now can we move things. Sophia: Have you seen this movie Cloud 9? It was Tom Hanks and Halle Berry. It was the first time I saw the idea that the people who are in your life are meant to be in your life, and you have more than one lifetime to be with these people, and they can come back in different forms, similar to what you said earlier of sometimes a child was actually the soul of a grandparent, or a great great great grandparent. And this movie played up that idea, which is beautiful, especially as a parent. It's such a beautiful idea that you have more than one lifetime with the people you love. It sounds like that's what you experience too. Sophia: But the purpose is just to evolve the soul? Deborah: Yes. I'm pretty sure. And I say I'm pretty sure because I think that the moment we start dating things in this realm as fact is when we become like very dogmatic. So I am inclined to believe that our sole purpose is to experience love, exist in love, to be able to see love all around us and within us, and realize that it's very much like an inside job. Sophia: I agree. So my big question is why is that so difficult and difficult for most everyone. Deborah: I think because we, as a human family, we need to make very hard lessons. We don't listen to the subtle whispers or the gentle nudges and guides towards… We are not really like yet attuned to the path of least resistance. We're still trying to swim upstream with a lot of things, but I think that as some of us, maybe one by one, maybe whole groups of people start to realize that doesn't need to be so difficult, as actually just deciding to make things less difficult, is step one on experiencing love, and going with the river, and listening to divine will rather than personal will, a little bit more. Sophia: What is divine will? Deborah: I think that divine will is love. It's like that source. And I think that for me love is god, god is love. But it's not like this being not separate us, it's in everything. And so this source, this love, has its own personal will, and basically wants us to see love all around us, and to see… basically love wants us to love, but we also have our personal will. We have free will. And this is why I don't give too much attention to like astrology, or things that are predestined because we were born under the sign this is what your life will be. I think maybe we could give like 30 percent of predestination but the rest is free will. And from that place of free will, we have our personal will, and our personal will is the words, I am. I am this body, I am this age, I am from this place, and really holding fast to that identity. And then from this identity that I've created, or that I've been conditioned into, what are the decisions I make with my life and how will that play out. How will I share and speak with others? Then divine will is, would it be easier if you don't hold so strongly to that story? If you just let yourself evolve into what the lessons from the wisdom you've gained are teaching you, let yourself evolve, let yourself grow. But you will have to challenge what that identity is. You'll have to let go of the stories, your pain, your suffering. But we are addicted to our suffering. Sophia: We are! Why are we?! Because it's more comfortable, it's familiar? Deborah: I think that we are also used to connecting from a place of suffering. Sophia: Do you think that's been true for a very long time? Or, do you think that’s a more modern day challenge? I just wonder, if in the old days, like the pre-Industrial Revolution, when life was more simple, if there was more community, more intimate connection? Deborah: I think when we were coming from more matriarchal traditions, there was more intimate connecting. But I feel like there's no mistake how we've been evolving as a human race. It's all meant to find balance, and create balance. Sophia: Do you believe there are no mistakes? Deborah: Yeah. No. No coincidences no mistakes. Sophia: You've touched upon it a bit, but what are your thoughts on destiny? There is because there's a lot of free will that can drive your ship. Deborah: Yes. So destiny… It’s interesting. I think it's really important to pay attention to, but it's an interesting question to ask like, What exactly is destiny? Because if there is free will, then that means that our spirit chooses our mom and dad, even chooses the sun that we're born under. And to choose the different experiences that will have. Then there's these moments that come in, and this could be destiny, where you are you meet the right person at the right time, and maybe you weren't choosing that person, or calling them, and they just happened to show up. Sophia: Can your spirits choose these things for you? They can conspire, right? Deborah: Oh totally. I think so yeah I think so yeah. It's interesting. Interesting. What is destiny to you? Good question to ask. So I think sometimes we have I would say it's like 30 percent destiny, 70 percent free will. Sometimes something really feels like OK. But to put it all of your attention on something being predestined, I don’t hink it works like that. Because you see people who are born into lives where everything should work out for them: they have great parents, they have all the support they need, and somehow they are not happy. They cannot find happiness, they cannot find joy, they can find love. And I think that’s their will. They are choosing not to be happy. But then you see people who are born into nothing, and have no one, and they do amazing things in the world, and they change things, and they find joy, and they find love. And it's an interesting thing. So yeah I really question luck, and I really question destiny, I question it, and I also pay attention to it. Sophia: We determined are luck too, right? Deborah: I think so. I think we create it. Sophia: How do you think we create it? Deborah: I think that we sort of attract good experiences when we're able to listen to like the subtle whispers in life, or even like in our past lives. We're able to listen to the more subtle nudgings from love. Sophia: So there's inherited luck too? Deborah: Oh definitely. I mean, I can't say definitely, but I really think so yeah. Luck, or destiny. I think based on free will. The things that your spirit needs to learn, the lessons that you need to learn, you will have the chance to learn them on repeat until you finally get the lesson, and then you go with the path of least resistance, from the path of peace, path of joy, path of love, but you have to really listen, and learn the lesson first, and then you are able to come into that place. We see this with, if you look at your friend who keeps on dating the same guy over and over and over again, but in different people. It's like the with different characters or something like that. That's a good example of living in a cyclical way until you learn the lesson and you're going to stay in the loop. Deborah: So what is your perspective on health and how much influence one has over one's physical well-being? Because, listening to you, I thought, I'd bet if you don't listen to the whispers, that contribute to disease. Because I would imagine, it ends up creating some blockages, and you're just not happy because you're not living your highest calling and you feel it. Deborah: Yeah. I have to say, I don't necessarily give a lot of energy towards genetics, you're genetically predisposed to these conditions. I think,, energetically, we have illnesses that come up as a way to teach us something, like cancer for example. Different cancers in different places mean different things. And there's a lot there, but our spirits could choose a family that has a lot of cancer in it. But the common thread is that from generation to generation, what has been passed down from family to family is attachment to anger. And so we have cancer manifest in us, but really we were needing to look at us is this old anger that we're holding onto, where does it come from, and how can we find a way to acknowledge it, and let it speak, and give it attention, and then let it fade away. Sophia: In your opinion, what portion of disease is caused from sub optimal energy? Deborah: Almost all of it. If we have anger, we’re not going to choose the right foods because that anger is going to be deciding for us. And so we're going to choose foods from a place of rebellion, or even digest the food from a place of anger. And if we have anger, the food is not going to digest well. If we're in a place of anger, then we're going to have resistance to exercise, and things like that. Yeah but we can choose a good way to clear my anger is to run, and start there, to choose to break through the anger. So I think that diet and exercise is extremely important to being healthy. But I think that there's also different energy that adds to our choices in the physical world. Sophia: Have you worked with clients who were diagnosed with cancer, and then had major energy shifts, and then their cancer went into remission? Deborah: Yes. There's been a few, but the people who are able to do this, really have very strong will. One had basically a year left. Went to chemo and radiation treatments. It's a very intense cancer, like a lymphoma. And, through working together, we learned there's a lot you're not saying, there's really a lot more you're holding back, but you need to speak to, a lot of what you’re holding in has affected largely your life: where you've chosen to live, what you've chosen to put into your body, and these kinds of things. Through a combination of being really strict with what they're eating, and focusing on health, and realizing that it was like their suffering that was wanting to have more sugar, or something like that, is how they were able to come into remission completely, no more radiation, no more killing than nothing. Sophia: Yeah I've heard of these stories and in most cases cancer is a real gift. It was a real blessing. I'm still trying to process the spirits, and was wondering if like attracts like. I think of my 4 year old… One day, at the end of a Friday, I asked her how school was. She said it was both good and bad. She said the bad was that, Someone in my class kept saying mean things to me all day. But the good thing is I decided he was not going to ruin my day. And he did not. And I thought, What an amazing example of choosing happiness, choosing to not live and selling else's stuff and but my husband is really good with that too choosing a positive attitude. And so I wonder when we oftentimes do have choice and that's the beauty of meditation: it reminds us that we can that we have a lot of choice, and it can affect the rest of the day after you meditate. But it sounds like it also, there’s a dimension that's not come we thought of, but maybe in choosing love, and choosing compassion, you then are also attracting different spirits that are positive. Because I guess you don't need to learn as much, because you’re already enlightened. Sophia: Because the darker spirits are not bad. You're saying they're just teachers. Deborah: Yes. Yes. Scary. But we can learn so much from not being afraid of our shadows. You can learn so much from not being afraid of our anger, acknowledging it, and not being afraid, however else the shadow manifests through jealousy, through insecurity. However it comes up if we cannot be afraid of it, if we can acknowledge and say, OK, this is here then, we can listen to what the lessons are. The more insecurities, or fears, and worries we have, the more you can maybe have different spirits. Maybe, maybe not. Maybe just life lessons, some things that happen in life, but maybe spirits too that show up and say, Hey, pay attention, there’s something to learn here. Ultimately, I think the big lesson that we all need to learn is to just find a way to go deeper into our love. And that might be through finding a way to give more, whether it's our time, or energy in some way, but to give is important. Or it's just receptivity. Also receiving the gifts, but whatever it is that can pull you closer to your love more time with animals, more time with nature, whatever that is, then you are not needing as hard lessons in life. A few months later, in May 2017, I led my first wellness event, which I titled the Innovators of Wellness. I asked Deborah to lead an opening ceremony to give you more flavor of Deborah's world. Here is an abridged recording of spirits when fears of the winds in the east we call you here now bring us clear heart centered communication feard says wins in the east 3 call you hear now into this phase Lessa the turn and face the South.